Greatness rarely works in a vacuum, free from the efforts and support of those around them. 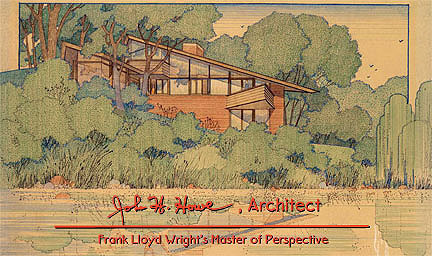 Frank Lloyd Wright was no different. Wright said many times of his chief-draftsman, John “Jack” Howe, that he is “the pencil in my hand.” More than that, Howe was one of several, most-trusted “pillars” relied upon to bring Wright’s ethereal concepts into reality on paper. Little is publicly known about Mr. Howe and his contribution to Wright’s works. Howe was a charter member of the Taliesin Fellowship, the architecture school and firm run by Mr. Wright. They produced such ground breaking works as the Guggenheim Museum, Fallingwater, Unitarian Church, Johnson Wax Headquarters, Marin County Civic Center, and more. All of the structures were new pinnacles for the Fellowship, whose members worked to envision architecture as more than decorative protection from the elements. Instead, architecture was viewed as an extension of the soul, as important to humanity as literature and art.